Looking for free online documentaries? Top Documentary Films delivers hundreds of free streaming documentaries you can watch online. The website offers many categories of documentaries in high-quality format, and it’s simple to stay up to date with new releases in the world of documentaries. Because the site only links to documentaries on YouTube and other streaming sites, you won’t catch everyday movie releases here, much less blockbusters. Since the movies linked to are in the public domain, anyone can view them for free. The website is very easy to browse and provides many ways to find a documentary that you'll like. This makes it fun and fast to find your next favorite film about real life in our amazing world. You can find documentaries in all types of categories on the site, making it easy to find a documentary on a particular subject. These topics include Technology, Science, Conspiracy, Biography, 9/11, Arts and Artists, History, Comedy, Drugs, Economics, Environment, Health, Media, Military and War, Mystery, Nature, Performing Arts, Philosophy, Politics, Psychology, Religion, Science, Sexuality, Sports, and Crime. You can also see all the documentaries available and sort them by newest, rating, votes, shares, comments, and title. 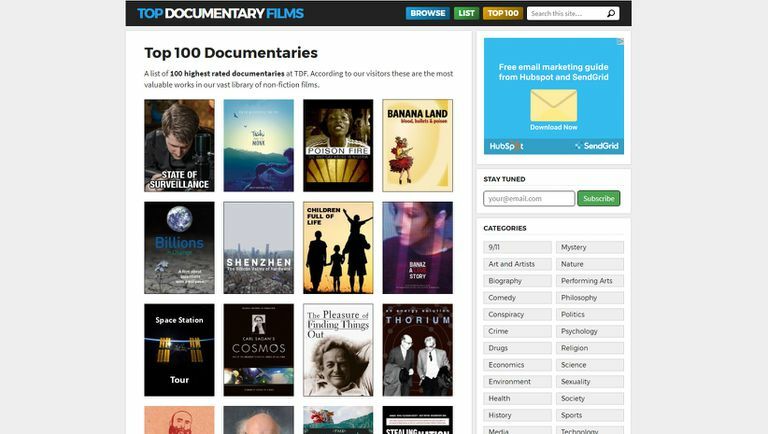 A webpage devoted to the site's Top 100 Documentaries displays clickable thumbnails of its 100 highest-rated documentaries. Each movie on the site features a rating and runtime along with a full synopsis, further helping you choose the next documentary you'd like to watch. There's even a place where users can give their reviews and discuss each movie. If you want to be alerted to the new films being offered, sign up for emails to get some of the more popular movies listed at Top Documentary Films once or twice a week. You can also subscribe to its RSS feed to stay even more current. Because you don't have to register with the website to watch free movies, you're all ready to go the moment you find one you'd like to watch. Video quality at the site ranges from anywhere from 144p all the way up to 720p. For optimal movie playback, you need to have Adobe Flash Player installed with an Internet browser like Google Chrome, Firefox, Internet Explorer, Safari, or Opera. These can be installed on Windows 10, 8, 7, or XP, Mac OS X 10.7 or higher, Ubuntu 10+, or Linux OS 11 or newer. It’s also important to have an Internet connection that can download data at or above 1 Mbps.